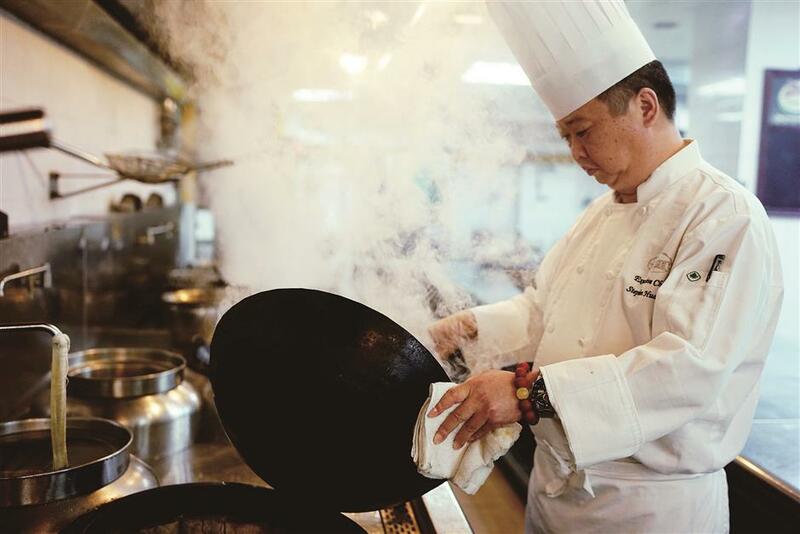 Huang Xin, a celebrated chef at the Hong Qiao State Guest Hotel in Shanghai, has cooked at more than 100 state banquets and receptions in the city. Some men are born great, some achieve greatness and some have greatness thrust upon them,” Malvolio said in William Shakespeare’s “Twelfth Night.” This quote certainly springs to mind when discussing the life of Huang Xin. The veteran chef took his first tentative steps toward becoming a chef as a child growing up in a small Shanghainese longtang (alleys). Today he takes confident strides as a celebrated chef, at the Hong Qiao State Guest Hotel, where he prepares state banquets for heads of state, which take between three and six months to prepare. It is difficult to say if Huang was destined for a life as a cuisinier or whether it was thrust upon him. Maybe it was a bit of both. The young culinary wannabee had no choice to cook and fend for himself as a child because his parents were both busy at work when his school day ended. But with a bit of empirical observational learning from neighbors in a shared kitchen, and a bit of his own initiative and ingenuity, Huang soon discovered he could whip up a delightful dish in no time at all. There was a time when his true vocation was compromised and ambitions to be a footballer were harbored. Huang was once a member of the city’s well renowned football team at Yichuan Fourth Primary School, today’s Shanghai Huayin Primary School, in Putuo District. It turned out to be nothing more than a flirtation with the beautiful game. He soon realized his passion for football was half baked and he had more hunger to become a chef. Three years after he served his time in culinary school, Huang was assigned to the Hong Qiao State Guest Hotel Shanghai, at the age of 19, in 1988, where he worked his way up to become the establishment’s executive chef. Since then, Huang has gone on to cook at more than 100 state banquets and receptions in Shanghai throughout his career. He has been the catalyst behind a team that served the APEC in 2001, the Shanghai Cooperation Organization summit in 2006 and the Conference on Interaction and Confidence-Building Measures in Asia in 2014. “You must consider the folk customs of each country and combine personal preference in order to perfect every detail. For example, most foreigners don’t eat preserved vegetables, so we only use pickled potherb mustard to make the broth for the classic yellow croaker noodle soup and then take them out before serving,” he explained. When preparing the welcoming state banquet for the SCO summit in 2006 at Xijiao State Guest Hotel, Huang took three months to orchestrate a menu that not only took the customs and flavor of each country, but ensured it also reflected Chinese culture and tradition. He revised the menu eight or nine times before finally settling on one. The highlight of the banquet was chicken smoked with Keemun, or Qimen black tea, which was served in the customized sand-fired pots that Huang had ordered in Yixing, Jiangsu Province. Many heads of state were deeply impressed by the elegant Chinese teaware. “I also created a 20-centimeter tall dough sculpture for each head of state according to their hobbies. I remember Vladimir Putin’s sculpture was doing taekwondo. Hu Jintao’s was reading. The sculptures and teaware were taken home by the guests,” Huang reflected proudly. The dishes served at state banquets are a blend of various Chinese and international cuisines. Huang likes to make changes to classic dishes, like using casher instead of peanut in Kung Pao chicken, and lower the degree of spiciness with a mixed sauce of Tabasco, ketchup and other condiments, as well as using bell pepper instead of dried Chinese chili. The 48-year-old could sit back and instruct younger chefs, but he insists on cooking every day to develop new dishes and craft his art.